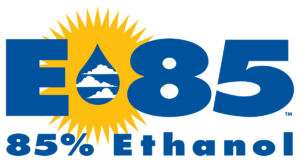 E85 is a flex fuel that contains 85% ethanol and 15% gasoline. Many retailers also offer additional mid-level ethanol blends such as E25 (25% ethanol) and E30 (30% ethanol). Flex Fuels and mid-level blends are for use in Flex Fuel Vehicles (FFVs) only. FFVs are specifically designed to adjust to any level of ethanol in fuel between 0 and 85%, providing drivers a choice at the pump. There are about 21 million FFVs on the road today.